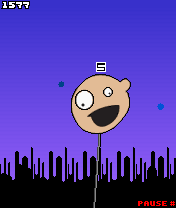 Head on a Stick is now available to play online, via the Head on a Stick mySpace page. 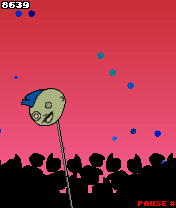 The de-liced Head on a Stick is now on Game Jump and Mobile Rated. So if you download it from either from today, there should be no problems! Oh no! Our worst nightmare came true! We have had a critical bug in Head on a Stick reported to us. If you manage to complete the last level with the music switched on then the game will hang. Sorry. Well we got straight on it and found the problem - now it's fixed. Thanks to Samurai X and Mr. Lou for reporting it. Please accept our apologies for this over-sight. You can blame our testers for being unable to get past the last level! High octane head balancing action on your mobile phone! Balance a series of heavier and smaller heads, increasing the difficulty on each level. Travel the world and beyond balancing Heads on Sticks. 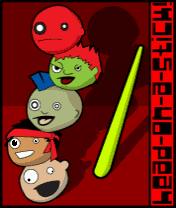 Balance the head by moving the stick - when the head wobbles to the right, press 6 and when it wobbles to the left, press 4. Best played with 2 thumbs. Beware, this is very addictive! New www.freegamesnacks.com web site coming soon! A new innovation in Mobile Gaming. Game Snacks are simple, but fun mini-games. All feature online high score tables and multiplayer gameplay. Game Snacks are available exclusively through www.gamejump.com for free, with advertising support. For Help with any Game Snacks game, please use the Contact Form on this site. Fruit Squash v1.2 is now available from ClickGamer. Updated demos are also available from RumbleX and GetJar. 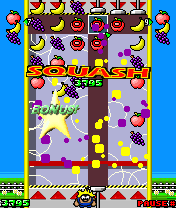 Fruit Squash v1.2 is undergoing final preparations for release. Orange Pixel will be handling the English-language version while Handinroll are preparing a localised Chinese-language version. Updated demos and full version will soon be available from Getjar, RumbleX and ClickGamer. Features updated graphics, new character that cheers you on and music! Fruit Squash is now available. Free Demos available from www.RumbleX.com and www.GetJar.com. Full version available from www.ClickGamer.com.